SmokeSignals Review - Does SmokeSignals Work to Help Stop Smoking? The SmokeSignals product is a patented handheld electronic cigarette case that is programmed with a schedule to slowly decrease cigarette usage frequency based on a personalize profile. When a customer signs up and orders SmokeSignals, they first fill out an extensive online questionnaire about their smoking habits and history. The electronic device is shipped to the customer containing a personalized tapering-off program that tells the user exactly when to smoke a cigarette on a schedule which minimizes the cravings and other symptoms associated with nicotine withdrawal. Each time a cigarette is removed from the SmokeSignals smart case, the time and date are captured, and the date is periodically uploaded via phone line to SmokeSignals central computer system. Smoking patterns are analyzed and an updated schedule is loaded into the device. Gradually over a four to eight week period, SmokeSignals takes users from their current cigarette habit down to no cigarettes. The technology utilized in the SmokeSignals device and smoking schedule formation was developed with the help of a grant from the National Institute of health. The scheduled gradual reduction used in the SmokeSignals program is carefully paced so that nicotine in the user's system is dosed very evenly throughout the course of the day, and it fades so gradually that withdrawal symptoms are minimized. The SmokeSignals program also includes a personalized Progress Page on the SmokeSignals website so users can check to see how they are doing and receive coaching tips. Daily emails are sent with advice corresponding to each step in the program. A DVD is included in the shipment with the SmokeSignals cigarette case that details the entire program and offers more helpful information pertaining to quitting. The philosophy behind the SmokeSignals program is that smoking is a conditioned habit, and to stop smoking, there must be a discontinuation between smoking and the cues and activities that the smoker associates with smoking. Since this relearning process takes time, the SmokeSignals schedule provides for a very gradual decrease in the frequency of cigarettes smoked to give the smoker time to adjust to the changes. Since SmokeSignals uses the smoker's own cigarettes in the personalized gradual reduction schedule, the ingredients vary according to the brand and style of cigarettes smoked. Nicotine is a common ingredient across cigarette brands. 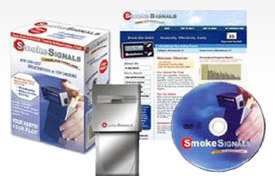 The SmokeSignals program is available for purchase at the manufacturer's website, via their toll-free phone number, or by mailing a check to their office in San Antonio, Texas. The price for the SmokeSignals electronic smart case, the instructional DVD, and website access coaching is $149.00. There is also an option to reactivate the SmokeSignals device for $79.00 if a customer has previously purchased the electronic cigarette case. The SmokeSignals service continuation can also be ordered separately at a price of $15.00 per month. SmokeSignals offers a 14-day money back guarantee for users who aren't satisfied with the program after two weeks. In clinical trials, SmokeSignals had a quitting success rate of 45%, compared with a success rate of 19% for users of the nicotine patch and 16% for users of nicotine gum. User testimonials regarding the SmokeSignals program are quite positive; many smokers were able to completely give up smoking with SmokeSignals even though they had tried and failed with other smoking cessation programs. The science behind the SmokeSignals program is sound, and the association with the National Institute of Health is impressive. SmokeSignals' success rate of 45% is also commendable, since that figure is on the higher end for smoking cessation programs. At $149, the initial investment in the SmokeSignals program is steep, and for those customers who can't wean themselves off cigarettes fairly soon after starting the program, the $15 per month subscription fee can add up quickly. Nicotine is a dangerous substance that is associated with a variety of health concerns, and a stop smoking program that includes the use of nicotine is prolonging the damage to the user. We have one other point, too: the 14-day money back guarantee seems a bit stingy, as most stop smoking aids offer a 30 to 90 day money-back guarantee.